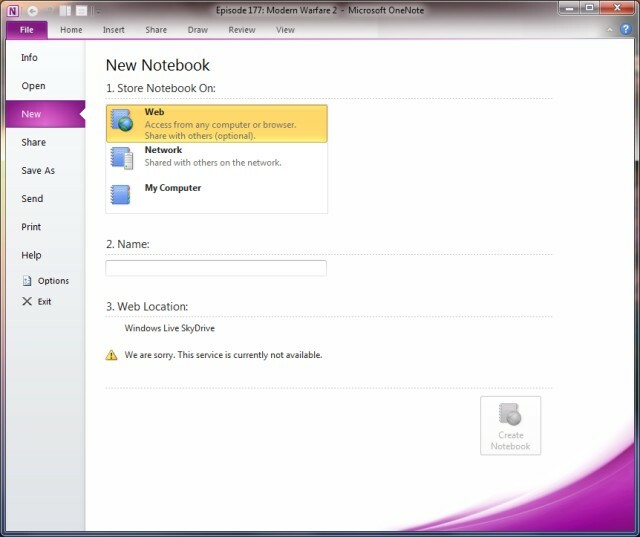 A few of you probably know I've been after storing OneNote Notebooks on the web for some time now, we've had the ability to stick them on the local network for sharing with other users, but I really need them on the web. Since the main collaborator I work with isn't on my local network and I'm always having to sync his changes back manually. OneNote 2010 has almost gotten there now, which will be using SkyDrive for storage. The technical preview didn't mention SkyDrive, although considering the Office Web Apps are using SkyDrive on their backend, rather than Office Live it isn't that surprising. Why not just set up IIS and WebDAV? What I mean is if you expose it as a WebDAV "file share," OneNote can sync up that way (as it does with SharePoint). That's what I use to share notebooks with others that aren't on my network (and between my desktop and laptop, for when I'm not at home). Well yeah, but I just use a network share for that, no changes will be made either end without it being synced first anyway for my own usage. Have you thought about both setting up a dropbox from getdropbox.com? The free 2GB storage should be plenty of space to share OneNote notebooks, has clients for *nix, Windows, & Mac hardware, and will automatically update any changes made to whatever pc you have the shared dropbox folder on. Paul - Any updates on this from Microsoft? I am waiting to use 2010 but the lack of SkyDrive is preventing me. Is it me or is the information (or lack thereof) coming out of Microsoft nonexistent? Hello Stefano - nothing official I guess it'll come online when the Office Web Apps go final - whenever that is. Just a quick update, this all seems to be up and running now.